Today, I’m celebrating five years and seven books in publishing. On Tuesday, October 18, 2011, is when it all began, and I want to thank those who have and will read my books. I’m giving away swag (cups, pens, jar openers -the red circle, book marks, etc. ), and books, and gift cards. How do you obtain such wonderful stuff? By telling me ONE of the following. Yep, you only have to answer one, but feel free to answer more. 1) What do you like about outlaw MC books? 2) What do you like about mercenary/spy/assassin books (similar to my Circle series)? 3) What other kind of book do you enjoy reading? Be sure to leave me your email address. It will be used for the giveaway only. 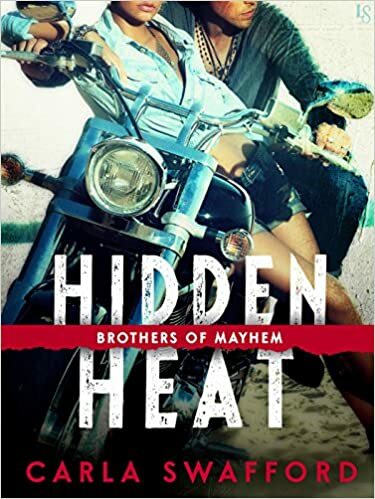 Be aware that FULL HEAT, the second standalone book in the Brothers of Mayhem series, is on sale for 0.99 cents for a limited time. And CIRCLE OF DESIRE is on sale for $1.99. If you want to know about future books, giveaways, and sales, be sure to subscribe to my newsletter. Click here and fill out the form. NAKED HEAT is due to come out the end of February 2017. Below are the books that make up The Circle series. Winners will be announce after 9 p.m. tonight! Congratulations Carla on your 5 year Anniversary!!! What I like about mercenary/spy/assassin books is the excitement! I know this will never happen to me, at least I hope it doesn’t, but that I can enjoy vicariously through others. I’m a big chicken at heart. I had to stop watching America’s Most Wanted at one time as I got too scared. Others do things, aka breaking the law, knocking out the jerk, blowing up stuff, things that I enjoy seeing. Also, I enjoy reading funny books such as Rachel Gibson’s and Katie Graykowski’s. The only ones that aren’t my reading material would be historical, paranormals and stories along those lines. Continued well wishes Carla on your exciting writing journey! One thing about mercenary/spy/assassin books is for sure the excitement in them. For an author, it’s writing not only the hot love scenes, but blowing things up. LOL! Hugs. Thanks, Ginger. Thanks, Colleen! I love all kinds too, as long as they’re romances. I must have a happy ending. Thank you, L Lam, for coming by and commenting! Everyone who had commented on October 18 is a winner. I will be sending you a $10 gift card to Amazon. Look out for an email from me. Thank you for helping me celebrate! Want to know what else Carla Swafford is up to? CLICK HERE to sign up for her NEWSLETTER. Your information will remain private. You can find Carla on Social Media too! He wanted to sit in THAT chair. The beach was beautiful this week. Mom and I at Shen Yun. On February 25, I was here, enjoying a wonderful game. #LoveMyPredators.